Earlier this year, we looked at what we described as the 'Mario Monti paradox' - that is, how surprisingly popular the Yale-educated Italian Prime Minister was, despite being the unelected head of an unelected government of technocrats. We also warned, though, that Monti's lack of a clear mandate from Italian voters would come back and haunt him once the (badly needed) reforms adopted by his cabinet started to bite. Well, that moment now seems to have come. According to a new SWG poll, 62% of Italians are against a second mandate for Monti. Even more significantly, trust in the Italian Prime Minister is at 36% - down from 71% when he entered office in November 2011. With the Italian general elections only a few months away (the latest reports suggest that they could be brought forward to 10 March) these findings complicate things further. None of Italy's political parties looks set to gather enough support to govern alone. The centre-left Democratic Party is currently ahead in opinion polls, but is likely to win no more than 25-26% of votes. Furthermore, Italian comedian Beppe Grillo's Five-Star Movement continues to poll at around 20% and has already ruled itself out of any alliance with 'establishment parties'. Sure enough, the Grillini will be tough in their opposition to the next government - whatever its political colour. 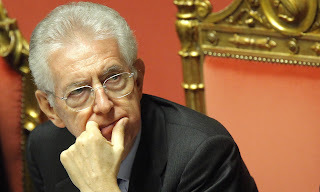 Add that Silvio Berlusconi's PdL party has also said that it "wouldn't bet one cent" on a second mandate for Monti, and it really seems that, as the electoral campaign draws closer, no-one wants Il Professore to stay on - except for one or two smaller centre parties. In other words, Italy is approaching the next general elections with no clear idea of what type of coalition would take over power - provided that Italian political parties are able to form one after the vote. Meanwhile, Italian voters are quite clearly saying that they would not be happy to end with an unelected Prime Minister again. Needless to say, all of this potentially opens for fresh political instability that Italy can ill-afford. Europe cannot handle the truth (to start with a Filmquote). Especially in its South the whole situation is simply completely unsustainable, but on the other hand the people are not ready for it. And not only because of the Euro. - the majority lives from paycheck to paycheck. Very difficult to make a real u-turn towards structural reforms. The majority doesnot want to run the risks associated with that. Combined with so called experts that shout all sorts of theories that basically intellectually only serve their political goals. In other words Europe needs a shock. Hopefully it is like something like Greece goes bust, but it might be that it has to be their own country. Monti only bought time. And did within the limits of the political possibilities a good job. Focus on the most important issues. However the measures are nowhere near enough. Anyway usually in around 2 years there is austerity fatigue and with democracies that can come up at the wrong time: around elections. What people would want to see is that things go better. Which is totally unrealistic in this crisis. No light at the end of the tunnel yet. Also from the way the other parties react it can be seen that they expect basically populist policies (the Hollande variety) likley will give them a better result at election time. So my guess. Monti indirectly will be sent home next election. Get Hollande policies and subsequently we will see either markets dumping Italy like Berlusconi is back in charge or the North pulling out the plug (or things falling apart by itself). There we have the shock. The likely Hollande style new government will as said course straight and at full speed into the iceberg. Will be sent home within a few months (unfortunately for France it is extremely difficult there) and new elections will take place. Likely with dusting off Monti (as the only Italian with credit abroad left and subsequently he can start to finish his job. Italy's budget and economy is nobody's business but Italy. It ts a sovereign nation, and it does not have to answer to anyone for anything it does. It merely has to be prepared to accept the consequences of its actions.